Trying to manage out in public with a one year-old and a three year-old can get difficult. But, I have learned a few tricks that make everyday travel a bit easier! First and foremost, I love being outside or doing something fun. So my kiddos and I are always going on "field trips" as I like to call them. 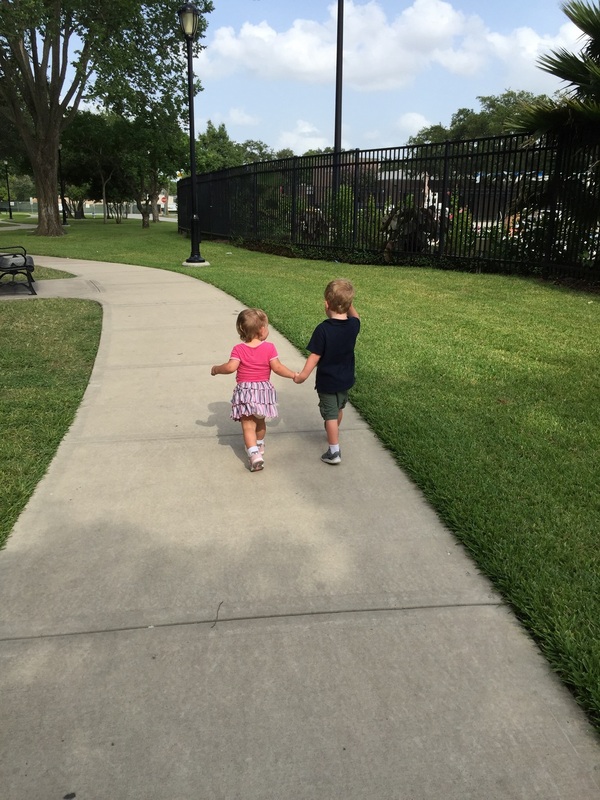 We love going to the Houston Zoo and The Children's Museum, but we also love little time fillers too! For example: we love going to Herman Or Belliare Park, Whole foods to get fruit, Barnes and Noble to adventure through the lavish kid section and play with every toy, and so much more. So, having 2 toddlers who want to touch and/or destroy everything can get a little tough at all those places. I had to quickly learn ways to keep everything fun and light. Overall, the hardest thing about being out with my cuties above is they are COMPLETE opposite. My cutie S (left) has a very nonchalant and independent personality. It tends to come out more when we are out. Now my big boy L (right) on the other hand, he cares who is near at all times. But, he also is very easily distracted. So, trying to balance their personalities is a full time job (that I would not trade for anything) that I have to stay focused on when out and about! 1) Give expectations before we go: I give the full run-down on what is going to happen. (We are going to go in and play for a little while before we go home. Or, we are going to go in this store and get some fruit. You can help me pick them out.) This usually helps them set their mind to what is going to happen and be focused on that. 2) Get the oldest into helping with the youngest: I always tell L to hold S's hand when we are out and sing to her when she is fussy. This helps when you are trying to juggle multiple things or need to divert the youngest. He just starts singing or making sill faces and S goes from tears to laughs in a heartbeat. 3) Establish the rules before-hand with some positive reinforcement: I tell both of them how I expect them to behave before we go wherever it is we are going that day. (I know you are probably thinking that for a one year-old that means nothing BUT, her understanding is so bright and by treating her like she is older, she does really well some days) Ex: We are going to go play at the park. I expect you to listen and play nice with the other children. If you are a good boy then we can play the computer game when we get home. This allows him to focus on that reward and think about his actions first. 4) This one is more geared towards S. I never let her get bored! : Anytime she has been focused on one thing for more than five minutes, I divert her attention to something else. When toddlers (especially that young) get bored they start searching for things to entertain them. That usually leads to some type of destruction! So, I go ahead and show her something new to play with to keep her entertained. I'm no pro but, these are some techniques that have helped me! Feel free to comment below with more ways that have helped you! Also, leave other topics you would like me to write about.